The past Monday, MapFit API users received a message informing them that the mapping platform has decided to shut down its developer APIs and focus on developing the underlying technology. The mail from MapFit indicates a shift in approach saying “We’ve also learned that there are a large number of mapping use cases and features that our small team won’t be able to provide in the near term and that would significantly slow down progress against our long-term vision”. This announcement comes just months after MapZen shutdown and the large Google Maps price hike – leaving developers and businesses stranded in search of an affordable and stable geolocation provider. MapFit’s reroute (pun intended) away from API’s is yet another reminder that the mapping space is not an easy business. For users, this means switching geolocation providers, which is a major pain – even the smallest of changes directly affects users that interact with your product. We get that. We started LocationIQ because there was a clear need for a simple, scalable & affordable geolocation service. We’re stable, profitable and are NOT looking to switch our business model/ ‘Sunset’ any API’s. We’ve got a generous free tier and an affordable pricing – this is why we serve billions of requests every day and are trusted by enterprises, startups and developers alike. 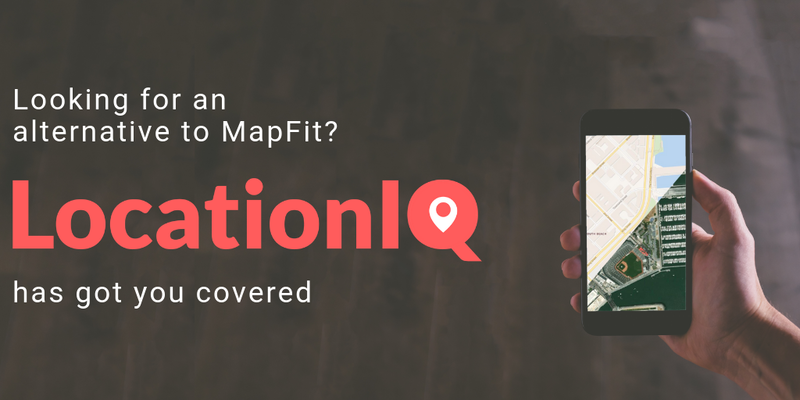 If you affected by Mapfit’s change or by the general chaos in the geolocation space, give us a shot at www.Locationiq.com. If your business has unique requirements, share it with us at [email protected] – and we’ll get back to you with a solution custom tailored for your need. Map tiles by Stamen Design, under CC BY 3.0.